The Practice of Medicinal Chemistry fills a gap in the list of available medicinal chemistry literature. It is a single-volume source on the practical aspects of medicinal chemistry. Considered ""the Bible"" by medicinal chemists, the book emphasizes the methods that chemists use to conduct their research and design new drug entities. It serves as a practical handbook about the drug discovery process, from conception of the molecules to drug production. 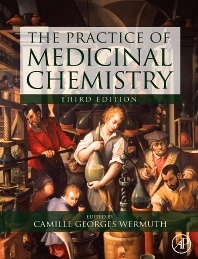 The first part of the book covers the background of the subject matter, which includes the definition and history of medicinal chemistry, the measurement of biological activities, and the main phases of drug activity. The second part of the book presents the road to discovering a new lead compound and creating a working hypothesis. The main parts of the book discuss the optimization of the lead compound in terms of potency, selectivity, and safety. The Practice of Medicinal Chemistry can be considered a ""first-read"" or ""bedside book"" for readers who are embarking on a career in medicinal chemistry. II. How Big is Chemical Space? I. What is Pharmacological Space? Camille-Georges Wermuth PhD, Prof. and Founder of Prestwick Chemical, was Professor of Organic Chemistry and Medicinal Chemistry at the Faculty of Pharmacy, Louis Pasteur University, Strasbourg, France from 1969 to 2002. He became interested in Medicinal Chemistry during his two years of military service in the French Navy at the "Centre d’Etudes Physio-biologiques Appliquées à la Marine" in Toulon. During this time he worked under the supervision of Dr Henri Laborit, the scientist who invented artificial hibernation and discovered chlorpromazine. Professor Wermuths’ main research themes focus on the chemistry and the pharmacology of pyridazine derivatives. The 3-aminopyridazine pharmacophore, in particular, allowed him to accede to an impressive variety of biological activities, including antidepressant and anticonvulsant molecules; inhibitors of enzymes such as mono-amine-oxidases, phosphodiesterases and acetylcholinesterase; ligands for neuro-receptors: GABA-A receptor antagonists, serotonine 5-HT3 receptor antagonists, dopaminergic and muscarinic agonists. More recently, in collaboration with the scientists of the Sanofi Company, he developed potent antagonists of the 41 amino-acid neuropeptide CRF (corticotrophin-releasing factor) which regulates the release of ACTH and thus the synthesis of corticoids in the adrenal glands. Professor Wermuth has also, in collaboration with Professor Jean-Charles Schwartz and Doctor Pierre Sokoloff (INSERM, Paris), developed selective ligands of the newly discovered dopamine D3 receptor. After a three-year exploratory phase, this research has led to nanomolar partial agonists which may prove useful in the treatment of the cocaine-withdrawal syndrome. Dr. Wermuth is co-author or editor of several books, the author of over 250 scientific papers and holds nearly 60 patents. Professor Wermuth is also the recipient of the Charles Mentzer Prize of the Société Française de Chimie Thérapeutique, the Léon Velluz Prize of the French Academy of Science, the Prix de l'Ordre des Pharmaciens by the French Academy of Pharmacy and the Nauta Award of the European Federation for Medicinal Chemistry for Pharmacochemistry in 2010.